It has been 13 months since I posted a blog post. In the past 12 months my son Levi (who turned 20 years old today) has had 4 seizures that required we rush to the E.R. to keep him alive. We never know when he might just stop breathing and 4 times within 12 months is too much, But yet by the grace of Jesus he is home again and happy as a claim like nothing ever happened. We might have some new answers and of course new anti seizure meds, but we still don't have solid assurance. I guess none of have that, but you know what I mean. It was a Friday night when Levi checked out and we check into the E.R. The next day they recommended we transfer him to Orlando for betters tests. We did this and spent 3 more days in that hospital. It was during that stay in the hospital that I tried to share my faith with a Muslim Doctor from Palestine. He was not to thrilled to chat faith, but the next Muslim women whom we crossed paths with allowed me to share my faith. We chatted about Jesus the prophet before she has to move on to the next medical patient requiring her attention. I found sharing life and faith with those around me easy and exciting as I looked for the people of peace God might put before me each and every day. Wherever the Lord places us in the daily journey ministry can abound even in our tragic moments. . 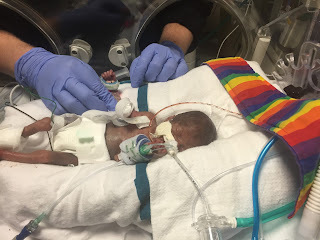 Many have prayed for us in our challenges and we thank God for so many people praying, A joy for me was when I got to pray for a couple who just had a baby on the edge of critical care. I was in the cafe eating dinner when I spotted a couple at the table next to me. I engaged them with a joyful fun comment only to see and hear their sorrow and challenge. Baby Mia was there new daughter who weighed in at 1 lb 2 oz. I offered to pray for the baby and this couple and they openly agree. As they left they stopped me and thanked me for caring and praying. The following Sunday I shared with our congregation the request of baby Mia for God to give her strength to pull through. The next day at the hospital I felt this urge several times to go find the parents to tell them we are praying for them still. The Holy Spirit prompted me to go and seek out the parents of baby Mia. I only had a first name and weight. I found a nurse who tried to help me only to tell me 'we need a mother's last name". Then he said follow me to one more place. I was doubting but following. Then we turned down a hallway and Mia mom Jessica came around the corner. I was over joyed to find this mom. It was a divine moment. She updated me and I have her my card this time and asked her to keep me posted on her baby's progress and that we would be praying. Today she sent me a picture and an update. Please pray for this family and precious child. Jessica told me in the hospital that she will get to take her home in 2017 when she is healthy enough. My hope and prayer is that this mom and child get to go home maybe by Thanksgiving. Would you join me in praying for this baby? Mia ☺️ she's stable and in maybe 2 weeks they will decide whether to feed her or open her up if she's still not well, so I'm praying she doesn't need surgery . But her blood work is good no infection yet , and the Dr. is surprised that her blood work continues to get better despite her condition . God is good !